From its humble beginnings as a small startup, Parallels Inc. always envisioned a new way to approach virtualized computing. The story behind Parallels dictates a company filled with dozens of innovative industry firsts introduced with every new product release over the years. This unrivaled leadership in innovation began in 2006 with the introduction of mainstream virtualization on Mac computers by utilizing the Apple-intel architecture and has continued thanks in no small part to the multitudes of extraordinary employees who make Parallels the success it is today! The foundation of this Russian company was built by a brilliant developer named Nick Dobrovolskiy and serial entrepreneur Serguei Beloussov. While the advantages of Parallels Desktop (namely, the ability to avoid re-starting your Apple computer each time the transition from Mac OS to Windows and vice versa) were obvious from the beginning—achieving this goal on a larger scale required a visit Apple in Cupertino, California. 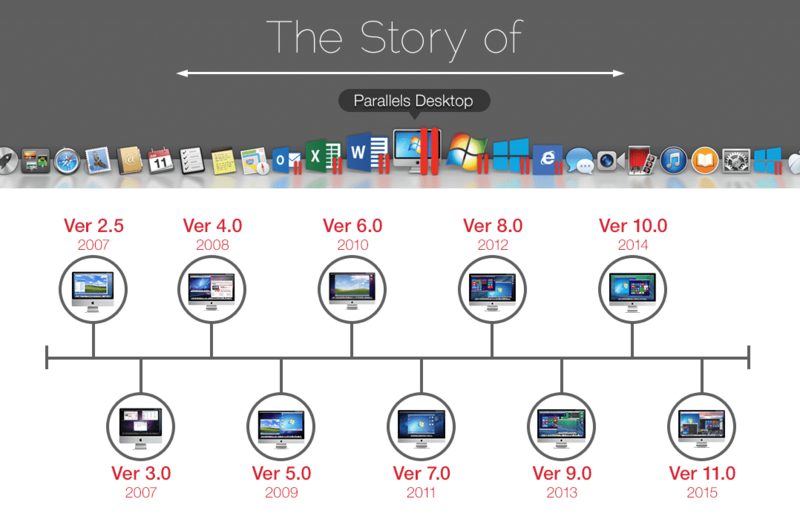 Parallels Desktop then joined the Apple Sales Channel and launched as the only solution for running Windows on Mac. 3. Devotion to developing Parallels Desktop for the customers. In the ever-changing world of technology, it’s common practice for industry leaders such as Apple or Microsoft to announce new releases every year. The ability to adapt is the ability to survive and Parallels has proven this over and over again. With every new release from other industry leaders, Parallels consistently builds a better product for customers. Whether it’s utilizing Apple-Intel architecture in 2006, to bringing Microsoft’s virtual assistant Cortana to Mac in 2015. This continued focus on the customer has spurred Parallels’ growth by supporting over 60 different guest operating systems and solutions for many devices such as your Apple computer, iOS devices, and most recently introduced: Parallels Remote Application Server. Growing exponentially from a small start-up to a global leader has given Parallels the resources to continue to provide a better product for customers. Parallels continues to strategically solve complex engineering and user-experience problems so that an application’s location is irrelevant. Parallels makes it not only easy but also cost-effective to use applications wherever they might be—local, remote, in the private datacenter, or in the cloud. Interested in Parallels Desktop and running your favorite applications not available to Mac? Try Parallels Desktop for 14 days free of charge.